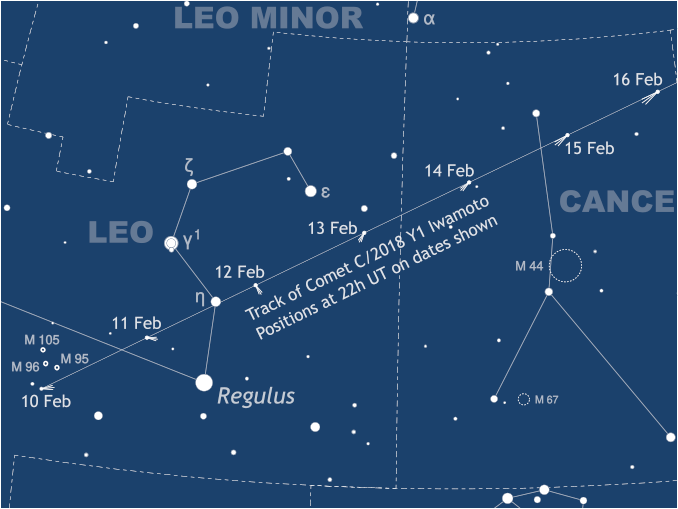 This extract of a high-resolution PDF finder chart suitable for printing obtained by clicking on the graphic above shows the track of Comet C/2018 Y1 Iwamoto from 10-20 February 2019. The comet is closest to Earth on 12 February at 20:10 UT when it lies 0.304 AU distant, or 118 times the distance of the Moon, and can be found traversing Leo at a rate of 7.2 degrees/day. AN graphic by Ade Ashford. Before the light from a waxing Moon becomes too obtrusive (full Moon occurs on 19 February), take full advantage of any clear nights to catch a glimpse of swift Comet C/2018 Y1 Iwamoto as it gallops through the constellations of Leo, Cancer and Gemini over the next ten nights. Click here to download a high-resolution PDF finder chart suitable for printing. Discovered by Japanese astronomer Masayuki Iwamoto in images captured on 18 December 2018, C/2018 Y1 orbits the Sun every 148.7 years in a highly eccentric path inclined to the ecliptic by an angle of 160 degrees. 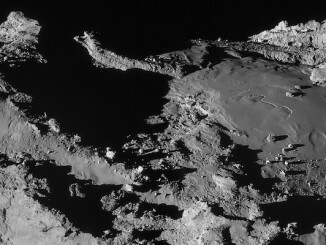 Comet Iwamoto came within 1.3 astronomical units (AU) of the Sun at perihelion on 6 February, but will plumb the depths of the solar system out beyond 245 AU at aphelion. The motion of Comet C/2018 Y1 Iwamoto’s nucleus is clearly evident as a line in this six-minute exposure concluding at 20:34.4 UT on 13 February, some 55 minutes before its closest approach to barred spiral galaxy NGC 2903 above right. Image credit: Ade Ashford used a HyperStar-enabled Celestron 8″ Edge HD at f/2.1 in conjunction with a Starlight Xpress Ultrastar C CCD camera. Comet C/2018 Y1 passes closest to Earth on 12 February at 20:10 UT when it lies 0.304 AU, or 45½ million kilometres away (some 118 times the distance of the Moon) and can be found traversing Leo at a rate of 7.2 degrees/day. 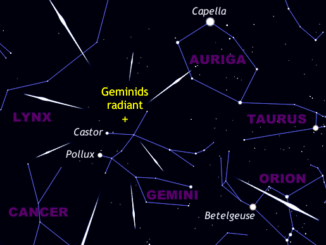 At opposition on 13 February, the comet transits around 12:30am GMT at an altitude exceeding 50 degrees for an observer in the heart of the British Isles. Predictions indicate that Comet Iwamoto might attain an integrated magnitude of +6 around closest approach, but don’t miss any viewing opportunities owing to the waxing Moon’s glare. Latest reports indicate that C/2018 Y1 has a coma approximately one-third of a degree across with a short tail. 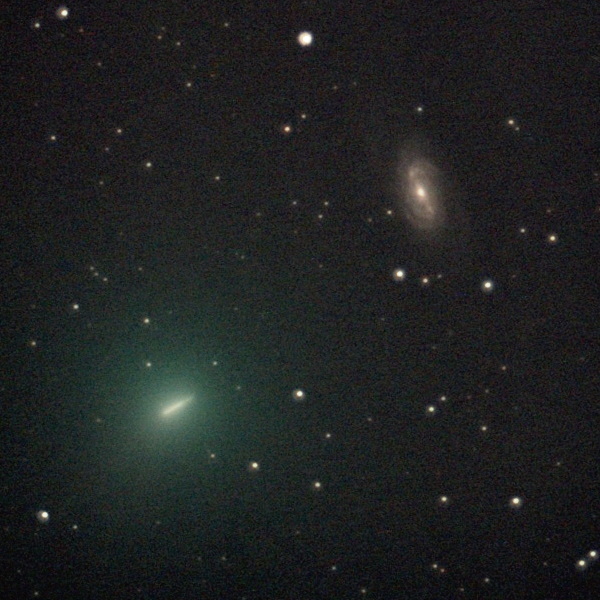 C/2018 Y1 passes just 3½ arcminutes to the southwest of magnitude +9 barred spiral galaxy NGC 2903 in Leo about 21:30 UT (9:30pm GMT) on 13 February. In fact, depending on the comet’s coma size and opacity, could the galaxy be obscured? Discovered by Sir William Herschel who catalogued it in 1784, NGC 2903 is visible in large binoculars or small telescopes and lies about 30 million light-years from Earth. This galaxy displays exquisite spiral arms, so astrophotographers are advised to prepare for a great shot – weather permitting. Comet Iwamoto’s close approach to NGC 2903 will be streamed by the Virtual Telescope Project. Follow this link to watch the conjunction live. This free online session is scheduled to start at 21:00 UT (9pm GMT) on 13 February. This topocentric ephemeris of Comet 2018 Y1 Iwamoto is computed for the centre of the British Isles (54°N, 2.5°W) at 22h UT (10pm GMT) on the dates shown. The comet’s right ascension (R.A.) and declination (Dec.) are for the current (J2019.1) epoch; Mag. is the predicted visual magnitude; °/d is the comet’s daily motion in degrees; Delta is the distance from Earth in astronomical units. AN computation and graphic by Ade Ashford/Minor Planet Ephemeris Service. 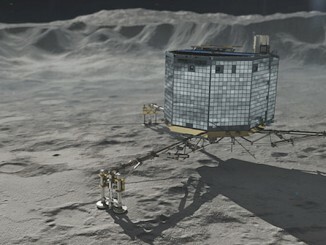 Ground controllers are analyzing a fault aboard Europe’s Rosetta spacecraft after an encounter with comet dust confused the probe’s navigation system, leaving the robot explorer in a temporary safe mode and halting regular science operations.